Toivo Fahlenius studied at the Viipuri Friends of Art Drawing School during the 1930s. Even during his student years, he worked at different advertising agencies and in 1934 he was employed by the agency Uuden Suomen Reklaamitoimisto, where he remained until the Winter War against Russia broke out in 1939. After the war, Fahlenius worked in the advertising departments of a number of larger companies, including Hankkija and HOK. 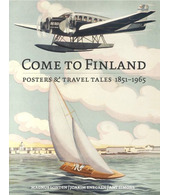 Fahlenius’ work includes several posters for the Finnish Fair Corporation. In 1933, he participated in a special competition organised in connection with the world exhibition in Chicago and was among the prize-winners. Today, Toivo Fahlenius is chiefly known for his magazine covers. He regularly designed covers and other illustrations for magazines, such as for the savings banks’ magazine Säästäjä. He also drew a few pin-up pictures for the gentlemen’s magazine, Kalle. In addition, he has designed an extensive range of book covers and postcards. Fahlenius was also a sculptor. One of his statues stands in the memorial chapel of Joensuu church.